Extrasolar Planet Light - Universe Galaxies And Stars Section. First light seen from an extrasolar planet. NASA's Spitzer telescope has detected the light from distant planets for the first time. Until now, extrasolar planets have only been discovered indirectly, by the effect of their gravity on their parent star. Astronomers first detected two planets using indirect methods, and then used Spitzer to perform followup observation with its Infrared instruments. They detected the difference in star brightness when the planet was in front and behind the star, and were able to calculate how much of this light was supplied by the planet. NASA's Spitzer space telescope has for the first time captured the light from two known planets orbiting stars other than our Sun. The findings mark the beginning of a new age of planetary science, in which "extrasolar" planets can be directly measured and compared. "Spitzer has provided us with a powerful new tool for learning about the temperatures, atmospheres and orbits of planets hundreds of light-years from Earth," said Dr. Drake Deming of NASA's Goddard Space Flight Center, Greenbelt, Md., lead author of a new study on one of the planets. "It's fantastic," said Dr. David Charbonneau of the Harvard- Smithsonian Center for Astrophysics, Cambridge, Mass., lead author of a separate study on a different planet. "We've been hunting for this light for almost 10 years, ever since extrasolar planets were first discovered." The Deming paper appears today in Nature's online publication; the Charbonneau paper will be published in an upcoming issue of the Astrophysical Journal. So far, all confirmed extrasolar planets, including the two recently observed by Spitzer, have been discovered indirectly, mainly by the "wobble" technique and more recently, the "transit" technique. In the first method, a planet is detected by the gravitational tug it exerts on its parent star, which makes the star wobble. In the second, a planet's presence is inferred when it passes in front of its star, causing the star to dim, or blink. Both strategies use visible-light Telescopes and indirectly reveal the mass and size of planets, respectively. In the new studies, Spitzer has directly observed the warm Infrared glows of two previously detected "hot Jupiter" planets, designated HD 209458b and TrES-1. 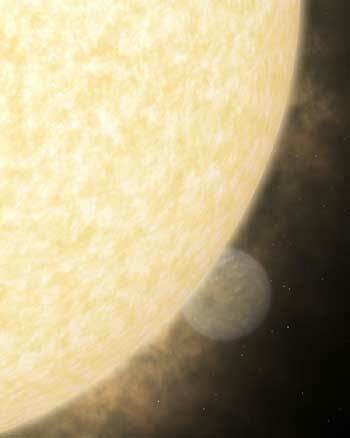 Hot Jupiters are extrasolar Gas giants that zip closely around their parent stars. From their toasty orbits, they soak up ample starlight and shine brightly in Infrared wavelengths. To distinguish this planet glow from that of the fiery hot stars, the Astronomers used a simple trick. First, they used Spitzer to collect the total Infrared light from both the stars and planets. Then, when the planets dipped behind the stars as part of their regular orbit, the Astronomers measured the Infrared light coming from just the stars. This pinpointed exactly how much Infrared light belonged to the planets. "In visible light, the glare of the star completely overwhelms the glimmer of light reflected by the planet," said Charbonneau. "In infrared, the star-planet contrast is more favorable because the planet emits its own light." The Spitzer data told the Astronomers that both planets are at least a steaming 1,000 Kelvin (727 degrees Celsius, 1340 Fahrenheit). These measurements confirm that hot Jupiters are indeed hot. Upcoming Spitzer observations using a range of Infrared wavelengths are expected to provide more information about the planets' winds and atmospheric compositions. The findings also reawaken a mystery that some Astronomers had laid to rest. planet HD 209458b is unusually puffy, or large for its mass, which some scientists thought was the result of an unseen planet's gravitational pull. If this theory had been correct, HD 209458b would have a non-circular orbit. Spitzer discovered that the planet does in fact follow a circular path. "We're back to square one," said Dr. Sara Seager, Carnegie Institution of Washington, Washington, co-author of the Deming paper. "For us theorists, that's fun." Spitzer is ideally suited for studying extrasolar planets known to transit, or cross, stars the size of our Sun out to distances of 500 light-years. Of the seven known transiting planets, only the two mentioned here meet those criteria. As more are discovered, Spitzer will be able to collect their light - a bonus for the observatory, considering it was not originally designed to see extrasolar planets. NASA's future Terrestrial planet Finder coronagraph, set to launch in 2016, will be able to directly image extrasolar planets as small as Earth. Shortly after its discovery in 1999, HD 209458b became the first planet detected via the transit method. That result came from two teams, one led by Charbonneau. TrES-1 was found via the transit method in 2004 as part of the NASA-funded Trans-Atlantic Exoplanet Survey, a ground-based telescope program established in part by Charbonneau.